The fall is one of my favorite times of year for many reasons. Not only do I love the leaves changing colours and the smell of the air – but each year I look forward to introducing the healthiest and most delicious harvest fruits and vegetables (loaded with vitamins, minerals and anti-oxidants!) From yams and sweet potatoes to eggplant, leeks, figs, apples and pears – we can't get enough of our fall produce! Wishing you a wonderful and healthy October! We were so excited to see all of our CityLine weight loss winners being premiered in the October issue of Chatelaine! They looked absolutely radiant and we are so proud of them. Check out the 7 day meal plan I created for Chatelaine for help you burn fat fast! Gin-Gins Hard Ginger Candies – These all-natural, gluten free candies are a must have. Their sweet and spicy flavour is perfect for cravings during the day or after a meal. If Halloween candy tempts you this year, pop a few of these into your mouth as a much healthier option. Ginger is also fantastic for stomach upset or nausea, so these pop in your purse treats are a good idea to always travel with. Macrobar - Almond butter with carob – We love these organic, gluten free and dairy free energy bars! The carob gives a delicious taste of chocolate without the guilt while the almond butter leaves you feeling satisfied longer. A perfect bar to eat to help squash your 3pm cravings. ProBiotic Dark Chocolate Bites – What better way to help increase your probiotic intake than to have these delicious dark chocolate bites. With one billion live cultures per bite, they are a great treat for you and your kids and will help promote a healthy digestive system. I just love Woolwich Dairy's Chevrai crumbles! When packing a salad or eating eggs, – these mini creamy bites jazz up all meals! 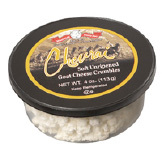 The added bonus... goat's cheese also offers an extra protein punch, is lower in fat and is highly digestible! Many of us associate pumpkins with the start of fall yet forget to recognize the nutritious benefits that these wonderful vegetables have to offer. Full of vitamins, minerals, antioxidants, and beta-carotene, they are a great option for cooking into soups or using as a baking ingredient. Pumpkins also have a high water content and are a low source of fat, making them an ideal snack. You can try roasting pumpkin with some cinnamon or ginger to get the natural feel of this nutritious fall vegetable. Add squash, apple and onion and continue to heat at medium heat for 50 minutes or until all vegetables can be easily pierced with a fork. Slice onion coarsely then sauté in ½ tsp oil till slightly golden. bake 380 degree for 30 minutes or until topping is golden. Steam cauliflower, onion and garlic for 10 minutes. Allow to cool for a couple of minutes. Place cauliflower, onion, garlic, butter and olive oil in a food processor. Add salt and pepper to taste. Process until smooth and creamy.